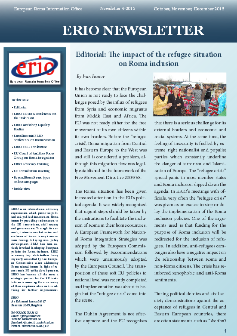 ERIO's fourth newsletter is now online. The printed version is available in 250 copies. The newsletter contains following articles. U.S. Senator Ben Cardin (D-Md. ), Ranking Member of the Senate Foreign Relations Committee, commended the nomination of Dr. Ethel Brooks to serve as a member of the United Stated Holocaust Memorial Council. Senator Cardin, who also serves as Special Representative on Anti-Semitism, Racism, and Intolerance for Organization Security and Cooperation in Europe (OSCE) Parliamentary Assembly, had recommended the appointment of Dr. Brooks to the White House. “Seven decades after the Nazi’s destroyed the so-called ‘Gypsy Family Camp,’ killing 2,879 Romani men, women and children in a single night, I welcome the President’s decision to appoint Dr. Ethel Brooks as a member of the U.S. Holocaust Memorial Museum Council. The Holocaust Memorial Museum is our country’s pre-eminent federal body entrusted with preserving the memory of the victims of the Holocaust and advancing knowledge, teaching and research related all aspects of the Holocaust. I am confident that Dr. Brooks will contribute greatly to those goals. Much more must be done to teach about the genocide of Roma and to combat pernicious bigotry and discrimination against Roma." The civic association Romano kher - Rómsky dom (Roma House) has produced an analysis of selected Slovak media outlets in collaboration with the Media Academy, focusing on those outlets that significantly contribute to creating the image of various minorities for the Slovak public. The survey monitored the period from the beginning of June to the end of October 2015. The analysis demonstrated that, just as many media have presented Romani people as an homogenous group until now, they have also presented refugees as a monolithic group with whom there are primarily problems. They have been supported in this by politiicans who have labeled the "Romani problem" unsolvable and called it sufficient reason to dissuade Slovakia from receiving refugees as well. Romani people have been pushed into the background of Slovak media coverage by the coverage of refugees, but from the perspective of how the media works with minority topics, the authors of the survey say nothing about the media has changed. Some media, such as the daily news outlets Denník N, SME, RTVS, and aktualne.sk, have, however, intentionally defended good examples and done their best to improve the negative image of Romani people. What has been suspected for several days has now been officially confirmed. Hungarian footballer Norbert Balogh will continue his career as a player in the highest Italian competition, the A Series, as a member of Palermo. The Italian club has paid EUR 2.2 million for Balogh. He has signed a contract for four and a half years, during which he will earn a total of EUR 2.8 million, according to information released by his hometown sports club, VSC. Norbert is 197 centimeters tall and weighs 80 kilograms. He will be 20 in February. 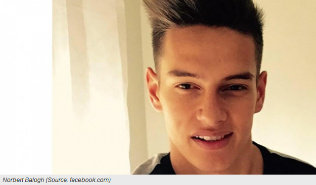 By joining the Palermo club, Balogh will become the highest-paid Hungarian footballer to date. "You'll see, Balogh will become the new Cavanim. I paid five million euro for him plus bonuses, and I also immediately refused a certain British club who offered to pay double for him shortly thereafter," said Maurizio Zamparini, president of the Palermo club. Social inclusion and the improvement of the quality of life of marginalised communities is one of the objectives of the EU Cohesion policy. This was the message conveyed by Commissioner Corina Crețu at the conference organised in the premises the European Parliament on November 17. The action fields supported by the Structural funds to help the social inclusion of Roma people include education, health and housing. To better achieve this objective implies the application of the principles of thematic and geographic concentration, national strategies, and the support of local authorities and civil society. Three serial killers who targeted members of Hungary's Roma minority in 2008 and 2009 were jailed for life on Tuesday, the state news agency MTI reported on Tuesday. The 18 months of violence, in which six people, including a small child, were killed and several more were injured, highlighted Hungary's difficulties in integrating its 500,000-strong Roma population. The killers were caught in August 2009. The killings came at a time when Hungary, a landlocked central European nation of 10 million, underwent economic and political crisis. Its gross domestic output plummeted, its government collapsed and the far-right Jobbik party rose to prominence. This section of the derelict Petite Ceinture railway – known for its hipster cafe and beer garden – is now home to a squatter camp too. Annabelle Azadé meets some of the 350 people who live in its makeshift shacks. For the past couple of years Boulevard Ornano in Paris’s 18th arrondissement has been mostly known for its hipster beer garden, La Recyclerie. Perched above the long-quiet rails of the Petite Ceinture – an abandoned circular railway built more than 150 years ago in the centre of Paris – it offers a cafe, stalls and gardening workshops to its mostly gentrified clientele. You are invited to take part in a drawing competition organised by the European Commission for 7-10 year olds. The aim of the competition is to help children, teachers and parents think about what we share that allows us to live together in an inclusive and mixed society. To enter, work in a group to create a drawing that represents the theme above. Draw your ideas of five ways we are all the same; whether we are Roma or not. The deadline for the competition is 16 February 2016. The European Union is currently inviting Action Grants supporting transnational projects to prevent and combat racism, xenophobia, homophobia and other forms of intolerance. This call for proposals for action grants is based on the 2015 annual work programme of the Rights, Equality and Citizenship Programme (REC Programme). The indicative available budget under this call for proposals is EUR 5.400.000. To be eligible, applications must fulfill all of the following criteria. Bodies set up by the European Union falling under Article 208 of the Financial Regulations (EU bodies and institutions) are not eligible for funding and cannot submit applications. They can be associated to an application, but their costs will not be co-financed.Only legally constituted organisations can participate. Natural persons (private individuals) are not allowed to submit applications. Non-profit organisation must be: a legal entity that is by its legal form non-profit-making; or has a legal statutory obligation not to distribute profits to its shareholders or individual members. The provision that profits will not be distributed must be clearly stipulated either in the law or in the statutes of the organisation; decisions on (not) distributing profits made by its managing board, associates, stakeholders, members or representatives are not sufficient proof of the non-profit nature. Eligible country: All EU Member states including Iceland and Liechtenstein. EU Member Countries: Austria, Belgium, Bulgaria, Croatia, Republic of Cyprus, Czech Republic, Denmark, Estonia, Finland, France, Germany, Greece, Hungary, Ireland, Italy, Latvia, Lithuania, Luxembourg, Malta, Netherlands, Poland, Portugal, Romania, Slovakia, Slovenia, Spain, Sweden and the UK. How to Apply Applicants must submit applications via PRIAMOS online system. For more information, please visit EU Action Grants here.